Sanyo makes economical and reliable hub dynamos for commuters. The Sanyo H27 hub dynamo is the perfect low cost solution for bicycle lighting. The H27 has sealed cartridge bearings. The hub powers many different six volt headlights including both halogen and LED headlamps (as well as taillights) made by Busch & Müller, Schmidt, Supernova, Spanninga, and Inoled. Click here for images of various headlight beams. The H27 is available in 28 hole, 32 hole and 36 hole drilling. The hub takes a standard quick release skewer. You can buy it with a skewer from Sanyo, or with no skewer included. Buy it without the skewer if you will be using a locking skewer like the Pitlock. Sanyo makes other, lower cost hub dynamos, but the H27 is such a good value, I don't import the others. With a halogen bulb headlight only, use a 3 watt bulb. With a halogen headlight and taillight, the headlight uses a 2.4 watt bulb and the taillight is .6 watts. With modern LED headlights, you may choose whether or not to use a taillight and no change is required in the headlight. The H27 weighs about 1 pound 4 ounces without the skewer. The weight is from my postal scale. I don't have a gram scale so that will have to do. The photo shows the silver finish hub with a silver finish skewer. All of our latest hubs from Sanyo (January, 2013) have a black skewer, so as our old inventory depletes, all hubs will ship with a black skewer. H27 Silver finish, Bolt-On solid axle with nuts; 36 hole: $ 40.00 Aug, 2014: These are out of stock. I'm hoping to have more this fall. No firm date. Replacement connector for headlight wire: $ 0.14 Scroll down this page to see how the connector works. Call or email for a wheel quote. We have many other rims to choose from in 16" through 27", and we can build matching rear wheels. Note: By early February, 2013, we'll have the H27 with a bolt-on axle in silver, 36 hole. Optional taillight mount $5.50 may be required for some rear racks. Fork crown mount works with most caliper and V brakes. Other mounts also available at low cost. Similarly prices systems are available for other wheel sizes. Headlights without standlight available at slightly lower cost. People sometimes ask me what the difference in drag is between the Sanyo H27 and other hub dynamos like those from Wilfried Schmidt. Here's what I've learned as of April 2011. In bench testing on a specially built machine that replicates the mass of a typical cyclist, the H27 was tested with and without a 12 ohm resistor at an effective speed of 30 kph (18.64 mph). The resistor replicates the effect of the lights being on or off. With lights off, the drag measured 6.3 watts, and with lights on, 7.7 watts. This compares to Wilfried Schmidt's SON28 at 1.6 watts with lights off, and 7.2 watts with lights on. So, drag with the Sanyo is higher than with the SON28. The better quality Shimano hubs have less drag than the Sanyo, but not quite as low as the Schmidt. But keep in mind that hardly any cyclists using the SON28 claim to be able to feel any drag when they switch on their lights. Clearly, the Sanyo isn't the hub to buy if you're trying to set your best time at Paris Brest Paris, a 1200 killometer brevet in France with a 90 hour time limit. But for a typical commuting cyclist with a 5 to 10 mile ride, do you care if you arrive home from work one or two minutes later? In 2012 the NH-T10 has been discontinued. We have sold out and cannot get any more of these. We do still have some small parts. The NH-T10 has a short wire that's for sending current to your headlight. The wire has a plastic connector on its end. The wire is only a couple of inches long. We now have a 1.5 meter wire, 2 conductor, with a connector to attach to the wire from the NH-T10 dynamo. It has bare ends at the headlight end, and of course we stock the little connectors that are needed to make the connection at the headlight. You can cut the 1.5 meter wire to the correct length yourself, or better yet, tell us how long you need the wire to be and we'll cut it and attach the headlight connectors for you with our nice crimping tool. If you do a search on the internet for bicycle dynamo lighting systems, you will undoubtedly come across warnings about bulbs burning out if you ride your bike too fast. This is true of systems designed back in the 1920s, and used on bikes such as Raleigh three speeds up through the early 1980s. These were very crude systems by today's standards, with no voltage limiting. While you can still buy cheaply made dynamo lights that will blow bulbs on a downhill run, none of the systems I sell are so poorly made that you have to concern yourself with this. Without exception, every headlight I sell for use with either a hub dynamo or sidewall dynamo incorporates circuitry to prevent the overvoltage of the bulb. You have absolutely nothing to worry about. In Germany, most bicycles are required by law to be sold with lights, and the German government has quite specific requirements that these lights must meet. Since the German bicycle market is large, many manufacturers design their lights to conform to the German requirements. This is good since it means that lots of dynamo and light options are available from many different companies, and all of these lights are compatible with one and other. The Sanyo H27 dynohub meets the German government's StVZO regulations for bicycle lighting. Among other things, these regulations set the minimum speed at which a dynamo lighting system must provide adequate lighting. If you use the Sanyo H27 hub with a 26" or 700c rim and a headlight with a halogen bulb, you will achieve a bright light at about 5.5mph or so. If you used a Sanyo H27 with a 20" rim, the wheel would give you full brightness at a lower speed, but would have higher drag than than with the larger rim at the same speed. But the H27 will work well with 20" rims. If used with a Busch & Müller Lumotec IQ Fly headlight (which use extremely bright LEDs instead of a halogen bulb) the light will reach full brightness (but pulsing) at about 2 mph! 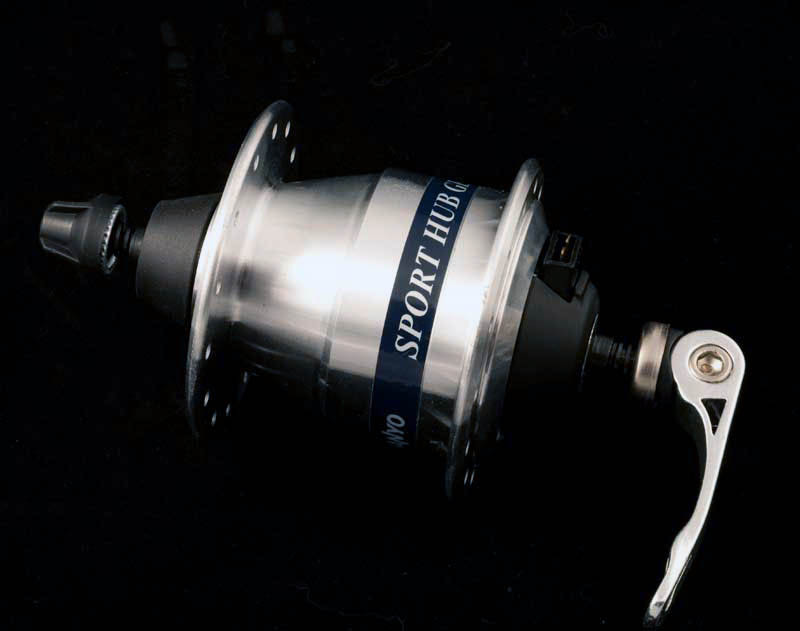 As of Aygust 2012, Sanyo has no plans to make a disc brake version of the H27 hub. The Sanyo H27 dynamo hub has several advantages over other power sources for bicycle lights. Compared to batteries, power is available whenever the front wheel is turning. It makes no difference how cold it is, or how long you've been riding. The light stays on at least until you stop. And most headlights stay lit at reduced intensity for several minutes after you stop, powered by a capacitor. Many batteries lose power in cold weather. With a dynamo hub, you don't need to remember to charge or replace the batteries. Also, by eliminating batteries, that's a whole pile of them that doesn't end up in a landfill some day. The Sanyo is environmentally friendly. 28 hole versions should be laced cross 2. 32 and 36 should be laced cross 3. The hub axle is hollow for use with a quick release skewer. You can buy the hub with or without a quick release skewer. To help keep your Sanyo hub equipped wheel from being stolen, use a Pitlock skewer. I offer the Sanyo hub alone or as a built wheel. See my custom wheelbuilding page for further details. 28 spokes, lace cross two. 32 and 36 spokes, lace cross three. 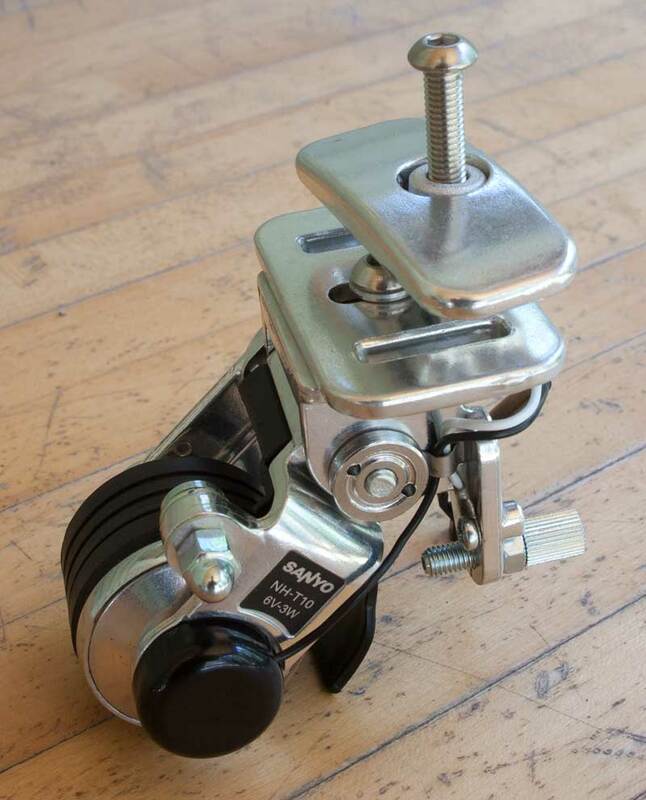 The Sanyo H27 should only be used with the connectors on the right (derailleur) side of the bicycle. Here are the two connectors on the H27 hub. The hub can be wired with a single wire on some bikes with certain lights. 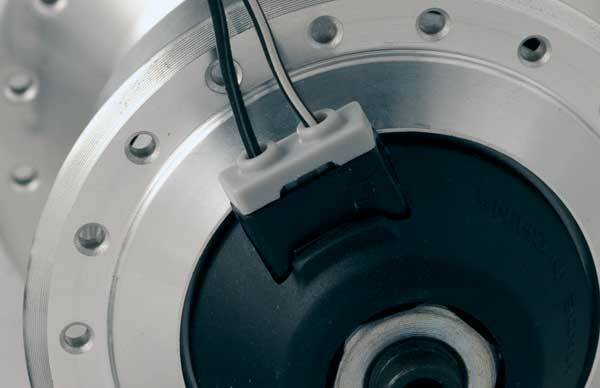 This is because the hub's axle is electrically connected to the dynamo. It's on the Ground side. On the connector, Ground is the connector on the right. You can't always count on your bike being able to support a single wire scheme. So it's best to plan on using two wires from the hub to the headlight. But since the hub axle is Ground, with some headlights and taillights, you must take care not to create a short circuit. A short won't damage anything, but it will cause the lights to not work at all, until the short circuit is eliminated. With Busch & Müller headlights and taillights, all connectors are clearly marked as either Power or Ground. Power has a lightning bolt. Ground has the normal parallel lines. These symbols will be molded into the plastic light housing next to the connector. Always connect Power to Power between the hub and the headlight, and then from the headlight to the taillight. And then connect Ground to Ground between the hub and headlight, and then to the taillight. While some headlights and taillights are not electrically connected to the bicycle's frame, many are. If your lights aren't Grounded, it may not matter if you make the correct connections. But you may not know whether or not your lights are electrically grounded. So it's just best to assume that your lights are Grounded, and wire them properly. Then you can't go wrong. With Busch & Müller lights, the all black wire is Power, and the black wire with white stripe is Ground. 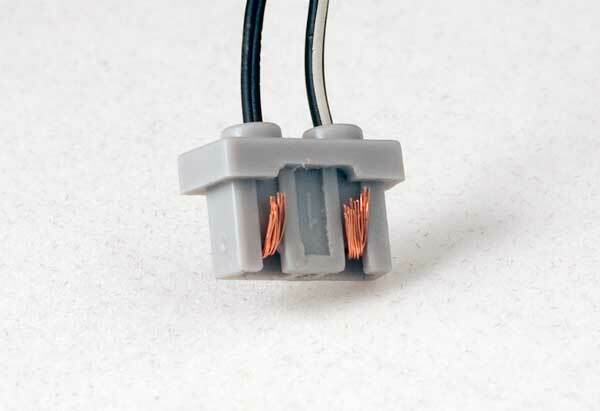 Some B&M headlights have copper connections at the base, where it attaches to the mount. If the mount is metal, the headlight can pick up Ground through the mount and then through the frame, since the H27 Grounds to the frame via its axle. Feed the wires though the connector provided with the H27 hub. Don't worry, we stock spare connectors! Insert the connector in to the hub. The connectors are angled to prevent the connection being made backwards. It can only go in the corect way. Push the connector all the way in. It will snap in place. To disconnect, you'll need to pry it open using perhaps a small screw driver in the slot you can see. Or you may be able to just wiggle it free with a fingernail. 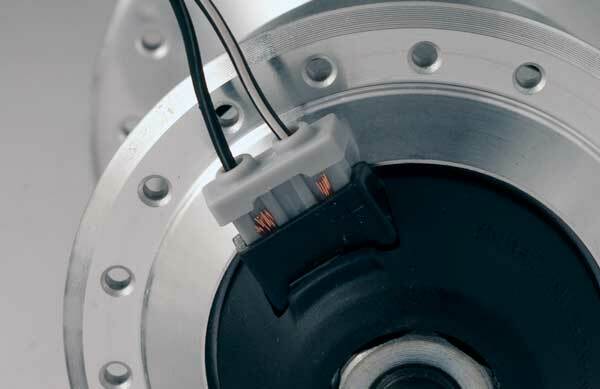 If you'll be taking the front wheel on and off the bike frequently, you may want to create another connection in the wire, perhaps two or three inches above the hub. 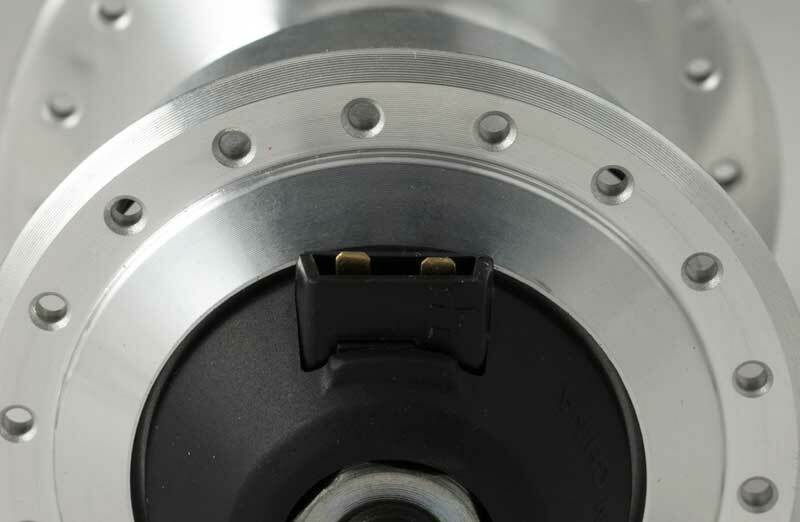 Try taking the connector off the hub a few times to see how easy it is for you. A fingernail may be all you need. If that's not comfortable for you, add another set of connectors. We have really nice ones (gold plated!) from Supernova, but you can get simple connector pairs inexpensively from Radio Shack. Until 2005 there were only halogen bulb headlights available for dynamo powered headlights. We've had LED taillights, but no LED headlights until the fall, 2004 when Busch & Müller introduced the DLumotec Topal LED headlight. The halogen headlights reach almost full brightness at about 5.5mph and are very bright at 6mph. At 2mph with a halogen bulb the headlight makes a dim flicker. So I haven't suggested that people use dynamo lights for mountain biking. But with the new LED headlights from Busch & Müller the light is very bright at 1.5mph. This makes it possible to use the SON for moderate singletrack mountain biking, especially if you augment the light on the bike with a helmet light. The ideal headlight for singletrack riding with the Sanyo H27 hub is the Supernova E3 Triple. Schezbzflat! My hub feels notchy! When you hold the wheel or hub in your hand and turn the axle, you'll feel a lot of resistance. There are 30 poles and magnets in the Sanyo H27 hub. That creates 30 points around the hub shell that the axle wants to settle in, and 30 corresponding points where the axle doesn't want to be. In the transitions between those points, the axle wants to turn in one direction or the other, to find the point where it wants to settle. As you ride, the hub turns relative to the axle, and 30 times in each rotation of the wheel, the hub wants to turn one way, and then the other, theoretically speeding you up and slowing you down, 30 times per rotation. At speed, the effects of these two forces almost completely cancel each other out, leaving you with extremely low drag overall. It's only when you don't have a lot of mass (your weight) and inertia (your speed) that the effect is to actually retard the rotation of the hub axle. So there's no reason to be concerned about the way the axle feels when turned by hand. So don't worry about the notchy feel of the axle when you turn it. It's not due to the bearings being out of adjustment. You can't feel the sealed cartridge bearings anyway. All you're feeling is the dynamo itself. In September, 2009 several companies announced chargers for battery powered "Gizmos" of the sort some people like to have on their handlebar while they ride. These include cell phones, GPS units, PDAs and the like. These chargers use the output of a dynamo hub, which would normally just power lights, and shunts some of it to charge batteries. Click here for the Busch & Müller E-WERK page. We have lots of headlights that work with the Sanyo H27. My original headlight page is here. It has up to date info on headlights made by Schmidt. My page with the most up to date info on Busch & Müller headlights is here. The best info on Supernova headlights is on the Supernova page. Info about some headlight beams is here. I frequently get requests from folks who want to use unswitched headlights with their dynamo hub. You can use unswitched lights, but you will have to make your own switch, or else the light will be on constantly, shortening the useful life of the headlight's halogen bulb. This is not a concern with LED headlights, which use a diode that lasts practically forever. And all of our taillights use LEDs. I do not have switches to sell. Nor can I advise you on constructing a switch. However, stores like Radio Shack sell all sorts of electrical switches and connectors. You should have no problem making yourself a switch. Be aware that the Sanyo's output is AC, not DC. I will point out that some people who use LED headlights leave them on all the time, since burnout of the LED isn't an issue, and having a light on during daylight does enhance your safety. So you may want to use a less expensive unswitched LED headlight with your Sanyo H27. It's your choice. For wiring instructions, please go to the Wiring Instructions page. The connector for the headlight wire is grey, and looks like the grey half of the two part connector used on Shimano dynamo hubs. However, the Sanyo connector is different, and is not at all compatible with Shimano's dynamo hubs, nor will the Shimano connector work with the Sanyo H27. We have quite a few taillights that can be attached to the headlight. If you use a taillight with a halogen headlight, you should use a different bulb than if you use the headlight alone. With an LED headlight, there's nothing to change in the headlight regardless of whether a taillight is used. Some people worry that if they have a taillight wired to the system, the wire might be damaged somehow, causing the taillight to fail. Others take their bikes on trips via airplane, and need to remove rear racks and fenders to pack the bike, and the dynamo powered taillights need to mount on either a rack or a fender, raising the issue of having to disconnect a wire along with the rack or fender. But these issues need not be a problem. I have high quality quick-connect wire connectors here from Supernova that can be used in-line, so that when you remove your rack, you quickly disconnect the wire right along with it. Inexpensive connectors are available at your local Radio Shack. Unbolting a rack is a lot more work than disconnecting an electrical connector that's designed for that purpose. And by using dynamo powered taillights, you reduce the need for batteries, the expense of buying new ones, and the hassle of being sure rechargeables are properly charged. Battery taillights are great for backing up dynamo taillights, in the rare case of a wire failure or circuit failure inside the light itself. As of March 2007 I also have heavy duty coaxial wire available which should make people less concerned about wire failures. 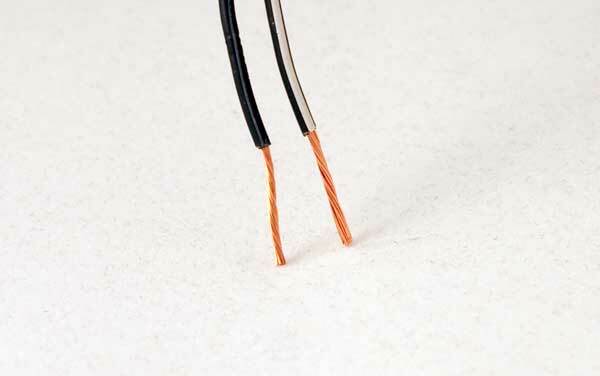 In practice, wire failures are extremely rare, even with the light weight wire from Busch & Müller. I know this because I have quite a few customers for whom I have installed their taillights myself, and who ride many thousands of miles a year, and are here with their bike quite frequently. It just isn't a problem, in practice. I sell several hundred wired taillights a year, and it's rare to have a customer call to complain about his wire failing. Almost all calls come while the customer is installing the system for the first time. I still recommend a second battery powered taillight, either for the added light, but mostly as a backup in the rare event a wire does fail. However, it's generally best to leave them switched off, and save the battery for when it's really needed on a rainy night. When you consider all of the pros and cons, if you could only have one taillight, if at all possible it should be wired and powered by the dynamo. There is a way to charge AA NiMH batteries with the Sanyo dynohub. Busch & Müller makes the Ixon and Ixon IQ headlights, which are battery powered. They also make the Ride & Charge, which is connected between the SON and the Ixon. Read all about it here. And there is now also the E-WERK. We also have a few chargers from Pedalpower+. As of March, 2013, we also have the USB-WERK from Busch & Müller. Click here for light mounting options. Click here for wiring instructions. Help keep your dynamo hub wheel from being stolen from your bike by using a Pitlock skewer. If you have a retail bicycle shop, or are a bicycle manufacturer or professional wheel builder, you can purchase the Sanyo H27 hubs or built wheels for resale. Any shop in the US or Canada can purchase Sanyo hubs and compatible lights for sale in your store. Please call me for wholesale pricing on hubs, lights and complete built wheels with Wheelsmith spokes and Velocity rims built by Peter Jon White. For more information, see my dealer page.